RCS Electrical Services is your Florida generator installation expert. Contact us for Generac generator installation, General Electric generator installation, Briggs and Stratton generator installation, Guardian generator installation, as well as Centurion, Onan, Kohler, and much more. We also specialize in Guardian generator repair, Generac generator repair, Centurion generator repair, Kohler generator repair, Briggs and Stratton generator repair, and many other brands of generator repair. Click now if you are in need of generator service, generator maintenance, generator installation, or generator repair. 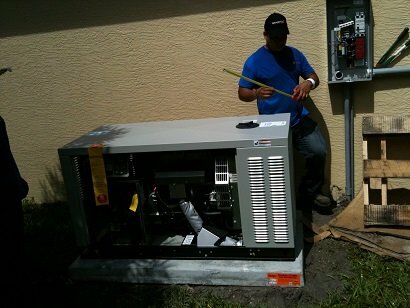 RCS Electrical Services offers a complete solution for your Florida generator installation. We handle the entire project, so that you have peace of mind in the knowledge that you have a single point of contact for all questions and concerns. Your Florida generator installation experts need to know your current electrical load or usage. This information is used to size a generator that can provide the amount of power you need. In order to do this, you must submit some information related to the size of your home or building, your current electrical equipment, and a list of your small appliances. Our technicians think of each other as being part of a family here at RCS Electrical Services. When we give you a completed project, is like you are also joining our own family, as we will continue to service your generator in the future. Not only you get a professional Florida generator installation, but we do it in a way that shows that we care, and that your family well being matters greatly to us. Contact us when you are ready for your Florida generator installation.